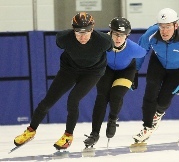 Learn to speed skate in our evening Development group, which skates on Tuesdays and Thursdays. 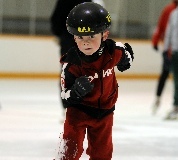 Kids, parents, grandparents can be on the ice all at the same time since skaters are broken up into small groups based on size and skill level. A family favourite! For those athletes seeking more sport-specific training, the advanced group offers a combination of optional dryland and on-ice training on Tuesday and Thursday nights, with an invitational Monday morning ice time. Description of our programs: click here! 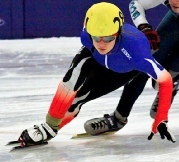 Athletes in our development and competitive programs work on earning their pins through a mastery of various speed skating techniques and practices. Click here to find out what is required of each pin level. Some skate for fitness, some skate to compete, all skate for fun. Come join fellow Masters Tuesday and Thursday evenings!